Coats on, all ready to go out in the crisp sunshine, and surprise! a thunderous shower of hail started. The dog took one look and fled to her neighbourhood-watch seat. No prizes for guessing the thoughts so eloquently expressed in those boot button eyes. In my book, shopping on a Saturday is something to be avoided at all costs. Too many harrassed-looking people who have been at work all week, and have too much to do at the weekend, trundling overloaded trolleys and dragging reluctant children in their wake, toddlers having (sometimes glorious) tantrums, and supermarket car parks which really require a specialised driving test all of their own for the hapless shopper to make sense of. But I went shopping this Saturday, friend Lynn in tow, although as someone who had been at work all week, she was barely awake. Off we went, bright and early. Not to Sainsbury's, but starting with a 15-minute drive along the Coast Road (sounds seasidey, doesn't it? But it's not, just 3 lanes of traffic through uninspiring housing developments, not a glimpse of water) to North Shields. Rather grim and run down in places, and where the infamous Meadowell riots took place a few years ago, North Shields is not a place one thinks of as offering an interesting shopping experience, linked though it may be to the altogether more charming Tynemouth. But it is interesting, and packed with history - including the singular fact that William Harbutt, the inventor of Plasticine, was born here in 1844. Aaah, Plasticine... But we went to shop. First stop, Tynemouth Architectural Salvage, a wonderful place located in the basement of the old Correction House, where Mr Terribly Serious and his sidekick, Captain Birdseye-lookalike in a woolly hat, stock all manner of interesting items, from lumpy old cinema seats with scratchy patterned upholstery, to an array of ancient and very deep sitz baths, one with rather alarming moulded grooves, clearly anatomical in purpose, in its base. All baths older than the 1950s seemed to require a stepladder to get into them. The place is not as bright and glittery as its website suggests, but rambling and slightly creepy, filled with fireplaces, tiles, doors, and assorted fascinating household objects that today would require two strong men to lift, but were probably in daily use by doughty women well accustomed to lifting heavy containers of hot water or coals - or, indeed, this being North Shields, baskets of herring. All the dim niches and corners were jam-packed with...well, old stuff, some of it mysteriously unidentifiable. My long-broken bathroom lock was handed over for examination, and Mr Terribly Serious opened it up, to reveal a total lack of innards. So that was why it only held the bathroom door shut if you slid the bolt....He surveyed it for a few moments, and announced in lugubrious tones "This one's dead". And then he went off into the back room, to re-emerge with three similar locks to cannibalise. I was impressed that he made no attempt to steer me towards the stock of reproduction locks or handles, preferring to repair rather than replace - unusual these days. Then it was off down the hill to the Fish Quay, which dates from the 13th century, and still has fishing boats and fish stalls, as well as Kristians, the best fish and chip shop in the North East. We resisted the chips, it being only just after 11, though we did notice that business was already brisk, and bought some oh-so-fresh fish next door before wandering round to look at the ongoing restoration of 300-year-old Clifford's Fort. 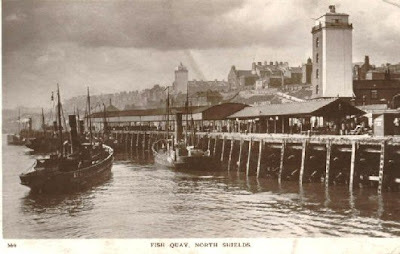 Then, beaten back to the car by a challenging wind straight off the sea, Lynn whimpering pathetically about her frozen ears, we pottered off home, vowing to a) eat more fish in future, and b) shop for it only at the North Shields Fish Quay, although next week we may wear earmuffs. Altogether a satisfying shopping trip. Nobody had rammed a trolley into our ankles, no one had screamed and thrown their tiny frame onto the ground howling for sweets, and parking had not involved patient manoevering round unmarked dead ends and overflowing recycling containers. And our fish had cost a tiny fraction of the price of Sainsbury's best. ...like putting a second coat of paint on the dining room door. Make some hazelnut and chocolate chunk biscuits. These have sweetened condensed milk in, so have a nice chewy centre. And eating several with a cup of tea doesn't give you a nasty paintbrush blister. I love being a tourist. The annoying kind that stops to take wonky pictures of bits of enormous famous landmarks to a standard that's a million miles away from those available-everywhere professional photographs where there aren't traffic cones, delivery vans or other grinning tourists, and where you don't spot that the handsome young cavalry chaps on gleaming horses have a steaming heap of manure underfoot. I had lots of opportunity to be that kind of tourist last Tuesday, and enjoyed it very much, although I'm sure the Lovely Son sighed inwardly now and again. But there were other treats in my little trip to London too. Squirrels, squirrels everywhere! And no need to report them to the warden, as we are supposed to do up here, where there are still red squirrel habitats to be protected at all cost. London abounds in grey squirrels, and I love them, childishly, extravagantly, for their looks, their enterprise and their sheer cheek. The Lovely Son once lived in a house where one would come into his room, ignoring the tabby princess on the bed, and try to bury peanuts in his house plants. The Houses of Parliament, a riot of high Gothic ornamentation and steeped in our history, so much of which could only be recalled in fragments, to our shame. What a fascinating tour we had; thank you so much, Joyce, especially for the behind-the-scenes moments and the personalised narrative. The unexpected treat of being allowed into the broom cupboard where a Suffragette (Emily Wilding-Davison, later to die after throwing herself under the King's horse and leaving continuing controversy about her desire, or otherwise, to commit suicide by so doing) hid throughout the night of the 1911 Census in order to be able to give her address as the House of Commons, thus becoming the first-ever woman to be able to claim this distinction. The little stretch of New River, a charming and green oasis in hot sunshine, which we entered through an unprepossessing gate off a busy Islington road. It was edged by enormous trees, and looked Victorian. We looked it up later, and found it to have been created in the 1600s. London never fails to surprise and impress in this way. The tabby princess condescending to sit on my knee. This was so astonishing that the LS took our photo. Spending a couple of evenings watching DVDs projected onto the sitting room wall. This felt like having a private cinema, and owning a projector had the added advantage, from a worrying mother's point of view, of keeping the film-obsessed Lovely Son out of the pub most evenings. The photograph of the tabby princess on my knee. Sadly, I had only just got out of bed, and now have a permanent record of my early morning horror look - mad hair, frightening eyebags. The princess looked lovely, as always, although she too is middle-aged and overweight. It's so unfair! The lugging of a heavy case up and down stairs at Newcastle Central Station and Jesmond Metros, which hurt my back, and made me spend my first two days back home sitting propped up with cushions, full of painkillers and oozing self-pity. Sort of middlingly interesting was the Hadrian exhibition at the British Museum. Too many big overbearing statues for my taste, and lots of busts, all revealing that the emperor looked strikingly like comedian Rory McGrath. We also realised how rich in Roman artefacts and history the North East really is, and how slow and irritating the queue of people in our timed-entry slot was, so we sloped off sharpish to the Egyptian gallery instead, to look at the mummies, where I could show the Lovely Son just what had made it so hard for me to drag him away when he was a wide-eyed five-year-old on his first trip to London. Hmmm, mummified cats....very strange, but he really had been enthralled at the time. Nice to be home again. I'm not going anywhere else for a while; all that excitement is exhausting. It's only a few days in Islington, and requires only the minimum amount of preparation (comfy shoes, layers of clothing, belated birthday presents for the Lovely Son), but the dog is in full moping mode already; I just have to think about a suitcase and she's off, following me round the house in eye-rolling misery. Once she gets handed over to Sandra, to be spoiled and indulged for a few days, she is instantly cheerful again, but I'm not supposed to know that, and should be feeling a lot more guilty and neglectful than I do. The two Kevins will be together again in the evenings (Sandra's sensible eldest son sleeps here and endures the cat's 5 a.m. wake-up calls) so I have no reason to worry. Though of course I will. Having just read Mountainear's latest about the loss of one of her chooks to the fox, I had a little reminisce about townies, urban prey and the predators I have known and loved. As city dwellers, we hold a rather different position on foxes from country folk: the sight of fox pawprints across a vegetable patch can be welcome, as our precious allotments can be overrun suddenly with rabbits. And not just the allotments - the Civic Centre, surrounded by congested roads and heavy pedestrian traffic too, is awash with rabbits, sitting calmly, and, it must be said, very cutely, amidst all the noise and bustle. And we don't keep chickens, because their predator is most likely to be the vandal. I have had some mighty hunters in the team over the years. There was Attie, mouse hunter and, perhaps, burglar, who once left me half a white rat, possibly someone's pet, and Jack, who started off as a wild little churchyard kitten (very wild - bit me fiercely on the nose after I plucked him out of two lanes of thundering traffic and kept him for evermore), who never quite shook off the call of the Dene, and would disappear for days, sometimes weeks. Eventually I put a name tag on his collar which asked anyone who found him wandering to return him to me, and I was amazed by how often he would be picked up miles from home, deep in the park, fat and cheerful. He often bit the would-be rescuer, too, to show his unreadiness to come home, but people seemed to rise to the challenge regardless. Jack was a formidable hunter, not the easiest pet for a city family, but at least he ate what he caught. He regularly brought home a rabbit, which he liked to eat under the kitchen table, skulking outside with it till we had gone to bed before dragging it through the cat flap. Souvenirs and leftovers were few; an ear or two, a tail, a bit of gall bladder, usually something cold and unpleasant to step in with bare feet in the morning. A young man delivering something at my door once turned green as we spotted Jack struggling up the road with an enormous rabbit in his jaws; it must have matched Jack in size, but he ate it all, and slept for three days, with a huge round tummy like a cartoon cat. He brought live mice home and would call for the kittens, who were clearly missing the hunting gene, and who would gaze at the gift in awe till we rescued and released it. I have a wonderful memory of two small wide-eyed kittens, one on each side of a mouse which was sitting busily washing its face and whiskers, Jack having lost interest, perhaps disappointed by the lacklustre performance of his proteges, who grew up to bring home the occasional moth or earthworm - hardly Masai Mara stuff - and who might only exert themselves to watch birds on tv. Life is slower and quieter now, with only one very aged cat left from the Magnificent Seven, but it's safe to walk in bare feet in the mornings, and a loud cat yowl only means "Where you?" and not "Mouse!" I think I prefer it that way. This is a Very Badly Behaved Dog, and this is about as high as she is prepared to hold her head at the moment. Coming home from having had her shampoo and cut, plus a nail trim (£26!! and I can't shop around because the horrible creature is always spectacularly carsick, so it has to be the dog grooming parlour nearby), we were just about home when we encountered a student pedalling very slowly on a bike. But he was on the pavement, not the road we had just crossed cautiously, and the dog, normally all too willing to throw herself under any cyclist's wheels, decided to rush out into the road instead, where she was almost hit by a van. Some abusive shrieking (me - and to my shame, directed at the dog, not the cyclist, who also qualified to be called an idiot), some horn honking (alarmed van driver), and complete lack of awareness (cyclist) ensued, and the dog came home with all the joy of having been liberated from the prison of Posh Pups evaporating in seconds. To make it worse, I had her harness and lead with me, but she had already wriggled out of it, aided by having newly-washed short hair. Phew! I have had a day of doing nothing at all, apart from the essential walks with the dog, tea making, and some rapid preparation of meals for self and team, except to start, devour avidly and finish Ann-Marie MacDonald's first novel 'Fall on Your Knees'. I don't do this sort of addictive, non-stop, totally-immersed reading very often nowadays, as it sort of knocks me out of reality a bit, which makes the resumption of normal routine a bit jarring for a day or two, so it remains a real treat. But before I sat down with this novel, which I enjoyed very much, I booked train tickets for a few days in London from next Saturday, and then frightened myself by looking at my bank balance, which is in a scary state, especially on a day as cold as today, when all brave declarations of economising on heating seem impossible to live up to. I thought I was living quite frugally, but I'm going to have to get a lot better at living on a pension than I seem to be at present. Maybe I shouldn't have ordered that Ottolenghi cookbook from Amazon...or booked the dog in for the full works at Posh Pups next Tuesday...too late now... Maybe living on lentils (euphemism for thrift and economy and eating what's in the pantry) for a while is in order. I'm looking forward to a few days with the Lovely Son and his large cat, the tabby princess. Part of the planned trip will include a visit to the Houses of Parliament, shown round by a friend-of-a-friend who welcomes some light relief from life in the House of Lords. I have wanted to do this for years. Exciting, no? The Lovely Son, not given to frugality (he's already mentioned two nice little French restaurants nearby) can plan the rest of my visit, so long as it involves thrift and economy. A forlorn hope, I suspect. Maybe November should be the month of living on lentils. Sometimes the weather forecast gets it so wrong, and today turned out not to be cold, windy and wet as foretold. I had to take pictures, to prove to Maggie in Toronto that just because it rained for her entire stay, it really isn't always so. Once every five months or so, we get some sunshine. This is Armstrong Bridge and a rather indecisive tree.